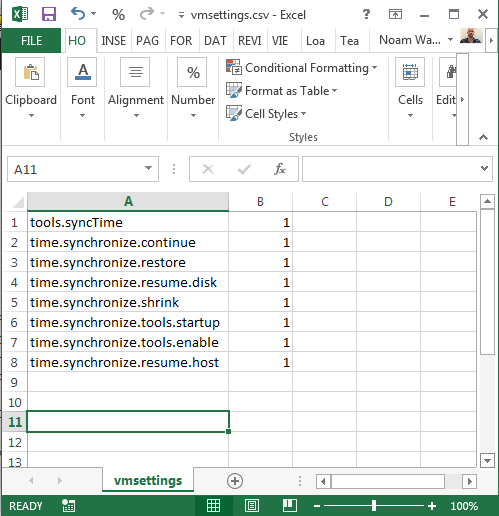 Recently I was tasked with modifying the VM advanced settings (or VMX settings) on all of our VMs. Since I didn’t want to manually edit the VMX files on 500+ VMs I resolved to make a script which could do the job instead. I eventually made a good and working script which I will go over below. First off I want to say that I have based a great deal of this script on some code that I found here: https://communities.vmware.com/docs/DOC-18653. Many thanks to Alan Renouf for posting this article! The script posted here has been improved a bit and is also more complete since it also connects to vcenter on its own. This should hopefully make this script useful even to admins who aren’t experienced with powershell. Write-Host "Adding $($_.Key) = $($_.Value) to configuration specifications"
Write-Host "Setting Advanced configuration for $($VM.Name)"
Write-Host "Finished applying advanced settings to VMs." 2. Edit two values in the #Variables section of the script. Set $vcenter to the name of your vcenter server and $clusterName to the name of your cluster (all VMs on this cluster will have their advanced settings changed according to what you wrote in the CSV file). I hope you will find the script useful!! Reblogged this on 1 Byte son 8 bits.